We are making a safe journey home into a basic workplace demand. Across the late-night economy, it takes workers two hours to earn the cost of a taxi home, when they are making £100s an hour for big-profit bars, hotels, and venues. Every night, workers are forced to trade two- or three-hours’ worth of their time for a safe journey home. Better than Zero’s Safe Home campaign has made an impact across late-night sectors like bar-work, catering, and entertainment. This winter, discontent with late night policies turned into forceful union demands. Cineworld Renfrew Street staff hit the headlines when they wrote to bosses about their experience of sexual harassment as a direct result of cuts to their taxi allowances, which has forced changes in the policy. Employers have started to respond to demands. Two major entertainment venues have committed to providing safe transport home for staff. The commitment from SWG3, a major events space and studio in Glasgow, was followed by the news that one of Scotland’s flagship comedy clubs, The Stand, would ensure a safe journey home for late-night staff. As well as these profit-driven venues, Aberdeen University, Strathclyde University, and East Dunbartonshire Council have all committed to the Safe Home initiative. Policy is changing too. After petitioning from the campaign, Glasgow City Council changed its licensing board recommendations to mandate that ‘all license holders should consider what arrangements are in place for staff getting home safely after the premises have closed… The Licensing Board is greatly encouraged by the ‘Safe Home’ initiative adopted by some license holders for their staff and would strongly encourage others to take a similarly responsible attitude to the safety of staff working within their premises at night.’ And as the prospect increases of 4am licenses, the board stated that applications would require ‘late night transport arrangements for staff’. It’s organised workers that changes the law - and when they start to change, workers are doing something right. As the evenings get lighter the dangers of getting home late are reduced. But we will continue to campaign for the policies in workplaces and in legislation that will guarantee a safe journey home, and build on our demand that precarious work becomes free from sexual harassment and violence. 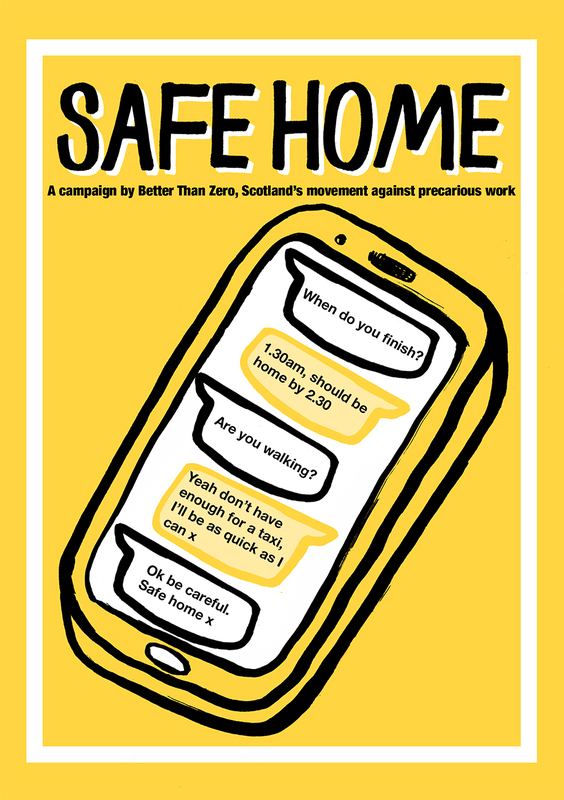 SAFE HOME is a campaign by Better Than Zero, Scotland’s movement against precarious work. SAFE HOME demands are clear: travel provided by employers for late night shifts. No more walking home worried about being attacked. No more dodgy customers waiting for us outside. We have been appalled by the sheer volume of reports coming into us about workers being attacked, followed, shouted at and abused on their way home. Often late-night workers are low paid and paying for a taxi is just not financially possible. It is not safe and it is not fair! One thing that will help workers win safe travel home from their employers is changing the licencing regulations. If licenced premises must take steps to ensure public safety, why do they not have to consider the safety of their workers? Handily for us, Glasgow City Council are reviewing their licencing regulations right now. The first public consultation event took place in Hillhead Library on Wednesday night and we were there to make our views clear. Part of the review is looking at potentially offering 4am licences to city centre clubs. If these employers are being given the opportunity to operate for longer and increase their profits, then they should be forced to guarantee a safe way home for their workers. The Councillors set up a stall inside the library. We set up ours on the pavement outside. The positive response from members of the public to our campaign was overwhelming. This is an issue that so many people can relate to. From workers themselves, to their friends, parents, grandparents…everyone we spoke to seemed to know someone who finishes late at night and struggles to get home safely. We encouraged a lot of people to go in and speak to the Councillors and share their concerns and experiences. You can submit a response to the consultation via email too - find out more here. We also visited lots of bars in the area, dropping off SAFE HOME flyers and BTZ newsletters and speaking to workers. Almost everyone we spoke to had heard about the campaign and are totally behind us. This really is an important issue that needs addressed! If you want to get involved and start fighting for your safety, get in touch with us. Monday 17th Sept, Tollcross Community Centre, 6-8pm. Alasdair Thomson, a bar worker from Inverness, has won a legal dispute over last-minute shift-cancellations that could lead to significant changes in employers’ practices in the hospitality industry. Alasdair had his shifts cancelled at the last minute on a number of occasions which left him unable to find other work to replace his lost wages. After contacting Better than Zero, a campaign against precarious work that is supported by the Scottish Trades Union Congress, Alasdair decided to pursue his case legally against SLONLO2 ltd, the company that held the lease at Phoenix Alehouse. ‘We hear more and more cases of bosses chopping and changing schedules as they please. Sometimes it is just because of shoddy scheduling, and other times it is used as a retaliation for behaviour that managers don’t approve of. In either case, it is wrong and now we know that it is legally untenable. Alasdair was represented by Thompson’s Solicitors, Scotland’s leading law firm supporting Trade Unions and employment rights. Better Than Zero, the trade union movement and their legal advisors are determined to quickly build on this precedent by establishing legal judgments on a minimum time period for an employer to cancel shifts. Today Volunteer Scotland has agreed to remove an advert for 280 unpaid roles at Edinburgh Hogmanay after it was discovered that the roles will displace paid work and will include mandatory training and set shifts. “We are pleased that Volunteer Scotland has taken down the Underbelly advert from their website. Any credibility that Underbelly had to justify these jobs as genuine volunteer opportunities has now vanished like the wages that the workers should be getting. Volunteering should be about giving-back to your local community not lining the pockets of private companies like Underbelly who have contributed very little to the people. At £26 per ticket, this is set to be the most expensive Hogmanay so far with Underbelly set to make millions from the event and yet almost 300 of those who will staff the event won’t receive a penny in wages. Section 44 of the NMW Act makes quite clear that the only organisations exempt from paying workers the minimum wage are “"charity, a voluntary organisation, an associated fund-raising body or a statutory body". Underbelly is a Private Limited Company which pocketed £419,478 for its 3 shareholders in 2016. It does not fulfil any of the legal definitions which make it exempt from paying the National Minimum Wage. We believe that Underbelly are therefore in breach of the NMW Act and will be pursuing them alongside the workers who have been underpaid for unlawful deduction of wages. We would urge Underbelly to pay all staff the living wage in accordance with the Fair Fringe Charter supported by Edinburgh City Council in August. Better than Zero is the nationwide campaign against zero hours contracts and poverty pay in the hospitality sector. We take direct action against the most exploitative employers in Scotland in order to raise awareness of their ill-treatment of staff and train activists to organise their workplaces against exploitative work practices. Underbelly were awarded the contract by Edinburgh City Council in March 2017 after it was taken from Unique Events who had hosted the event since 1993. Better Than Zero is back up and running with a new Scottish domain! Feel free to visit the website <www.betterthanzero.scot> and stay tuned for our latest news. Following the tremendous success at The G1 Group, the campaign is set to receive a special mention in the Scottish parliament via a motion launched by the Green party. Ross Greer MSP lodged the motion in January congratulating the use of direct action tactics to achieve genuine change for the workers of Scotland. A similar motion was lodged by the Greens leader Patrick Harvie MSP and currently has cross party support from over 20 MSPs. Following discussions between ourselves and G1’s HR Director - Paul Bailey, we are pleased to announce an array of agreed improvements to working conditions which (if fully implemented) will see a greatly improved outlook for G1 staff in the coming year. After a lengthy and positive discussion we were pleased to hear of a number of new systems and further planned changes which, if delivered, could meet many of the concerns we raised regarding uniform, contractual instability and tips. All new G1 colleagues shall receive a contract of employment before they start work. The Group will look at the possibility of introducing minimum hour contracts based on the average hours worked by staff (currently around 15 hours). No member of staff should be docked for small instances of lateness – The new clocking-in system should prevent this and people should be paid for the shift they clock in for. No member of staff should be docked their tips for breakages/spillages. The Group has adopted a Tronc system which sees 100% of electronic tips distributed according to local Tronc committees elected from each area of the workforce (i.e. front of house, KPs & cleaners etc). Each Tronc committee is overseen by a Tronc-master who cannot be a manager. Potential G1 staff will only be asked to shadow during a trial shift for up to 4 hours for which they will be paid. In response to what was a very positive meeting we agreed that Better than Zero would suspend all direct action against G1 venues for 3 months while discussions are ongoing. We will be meeting with the Group again in the New Year to discuss progress and how we can further support G1 staff. Should any member of G1 staff still face problems regarding any of the aforementioned issues then please do not hesitate to contact Better than Zero through our facebook page and we will be sure to raise it with HR. Amazon is one of the worst employers in Scotland. Despite making £billions in 2016, they still insist on employing 4,000 staff at their depot in Fife on zero-hours and temporary contracts on just above the minimum wage. Staff are routinely searched to ensure they haven't stolen goods and they are penalised for not scanning items in time. On Friday 25th November, Better than Zero joined forces with the People's Assembly in Fife to organise a mass picket of the Amazon warehouse in Dunfermline. For more than 3 hours we blocked the main road going in and out of their main distribution depot causing major disruption to all deliveries on their busiest day of the year - Black Friday. As a consequence of our direct action, senior management of Amazon UK were forced to sit-down with local MSPs to discuss the possibility of improving conditions including introducing the living wage. On Friday 29th July, Better than Zero activists (in conjunction with anti-racist campaigners) held a demonstration outside Byron Burger's flagship store in Glasgow in protest at the appalling decision of senior managers to lure 35 of their own staff to a fake training event in order for them to be interrogated and potentially deported. What is particularly reprehensible about their actions is that Byron Burger would have known about the status of these staff for a long period, and rather than do anything about it, they continued to exploit them on poverty pay and precarious contracts. Having spoken to staff and customers inside we made clear that our protest was not aimed at them but towards those senior managers who had taken the decision to betray hard-working staff in order to avoid a possible fine from the Home Office. The protests were organised in the same week as direct action in two branches in London, and ahead of planned action in Liverpool due to take place next week. Following the introduction of Osborne's phoney national living wage, loads of companies have claimed they cannot afford to pay their staff the new higher rate of minimum wage without removing staff benefits. Caffe Nero have taken away their staffs' free panini to pay for the rise. Pathetic behaviour from a company that make millions in profit each year. At this year's STUC Congress, our activists organised emergency action outside the Dundee branch of Caffe Nero. We got an amazing response from the people of Dundee, with many people deciding to go else where for their coffee once we told them why we were there. Later on in the day our young activists took to the stage of the STUC Congress and received unanimous support from the whole trade union movement in Scotland (and a standing ovation!). Last year McDonalds made a profit of $1.31 billion, Dominos made a £766 million profit and Sports Direct £290 million. What do they have in common? They all refuse to pay their staff a living wage. After an incredibly successful open branch meeting last month, Fast Food Rights Scotland held another open branch meeting on Friday the 11th March to build on the success of the global fast food rights movement. Aimed at fast food workers, workers on zero hour contracts or low pay/insecure work, the open branch is a place to meet similar workers, swap stories and find out how to organise in your workplace for better rights and conditions. On April 14th, campaigners joined together to take part in a global fast food day of action. We supported campaigners in Glasgow to demand £10 per hour, union rights, and an end to zero hours. Danger! Risk of Staff Exploitation! We took our demand to meet with Stefan King to several G1 establishments across Glasgow. Chris Stephens MP has lodged an early day motion in parliament to support the Better than Zero campaign. Better Than Zero presenters showcase the work of the campaign at the STUC's rally in Glasgow. Stefan King, are you listenin'? In the workplace we will build a union...organise! Our report on this important annual event.